Greetings friends and fellow crafters, LeeAnn here with a Water Activated Ink project from White Rose Crafts. I had a great time with this project and here is how I did it. First I used a panel of water color paper cut 4.25" x 5.5". I then took out my Distress Oxide Reinkers in Tumbled Glass, Mermaid Lagoon and Blueprint Sketch. I wet the paper a bit with a clean paint brush and dropped on some of the Tumbled Glass, once dry I did the same with Mermaid Lagoon, and again once dry I did the same with Blueprint Sketch, moving down the page allowing the inks to blend together but also giving them a chance to be alone. Once the entire panel was dry I spritzed with my clean water just to add some spotting. 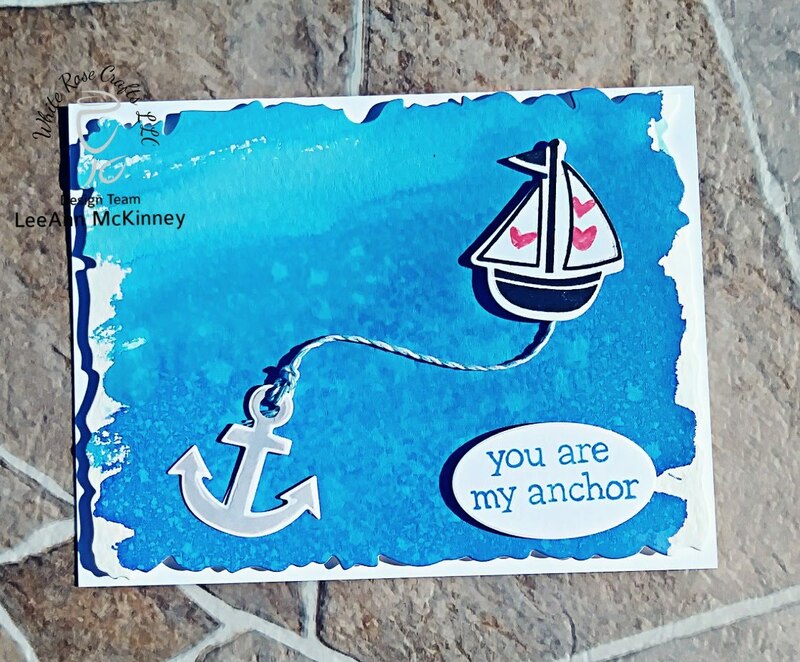 I stamped on a different panel the images from Lawn Fawns Float My Boat stamp set. I then used a set of distressed edge dies from my stash to cut out my panel, attached it to my card base with foam tape and then attached my images. I did attach the anchor to the boat using some Lawn Fawn bakers twine.